The Gulf of Tonkin Resolution was passed by Congress on August 7, 1964 in response to an incident in the Golf of Tonkin east of Vietnam that involved a tussle between American naval ships and North Vietnamese naval ships. This resolution allowed Lyndon B. Johnson to use military force in Vietnam without formal permission from congress. The incident in the Gulf of Tonkin on August 2, 1964 involved two United States warships, the USS Maddox and the USS Turner Joy, and three North Vietnamese torpedo boats. The American naval ships were on a mission to gather intelligence from North Vietnamese radio signals. The American ships were to go closer and closer into shore until they spotted enemy ships, and then leave. What happened was they engaged three torpedo boats from the North Vietnamese torpedo squadron and a sea battle resulted. Four American F-8 bombers then got involved and strafed the North Vietnamese boats in efforts to stop them from destroying the American boats. When all was said and done, the American boats and aircraft sustained only minor damage, and no American casualties were reported. However, four of the North Vietnamese sailors were killed and six of them were injured. Two days later the United States National Security Agency reported a second incident, but it was false radar and nothing actually happened. 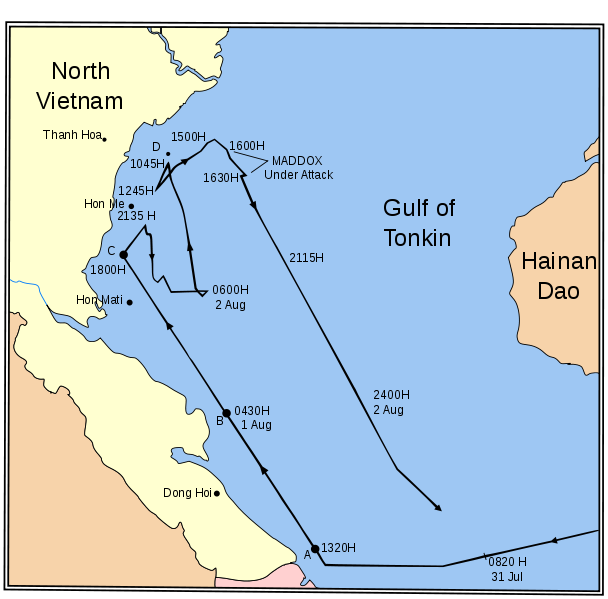 The Gulf of Tonkin Incident and Resolution caused a major escalation in the Vietnam War.